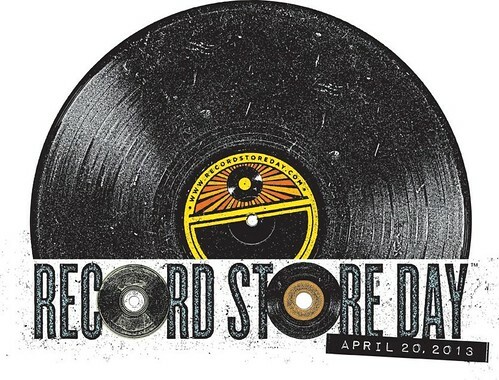 Saturday, April 20th of 2013 is Record Store Day and that means that independent record stores around the country will be having all kinds of sales, extended hours, exclusive releases and in some cases special events at their locations as well. Not just vinyl will be on sale of course, there’s plenty of CDs and tapes too. There’s a good write up of what several of the DC area’s record stores are doing for Record Store Day in the City Paper and you can read that here. However in this post I wanted to focus on what the area’s three most “metal” record stores, Vienna Music Exchange, Shockwave Records and Black Mess, will be doing. In addition, the Sound Garden in Baltimore will have Clutch make an in store appearance where they’ll play some acoustic songs as well as sign autographs. I contacted each of these record stores and some gave me more info than others. Below is what info I’ve gathered on what each store is doing for RSD along with their addresses and links to their websites. For Record Store Day the Vienna Music Exchange will have extended hours, 11am to 7pm. This store is tiny but they’ve got a killer stock of metal, punk and other underground music. You can see a full list on their website here. 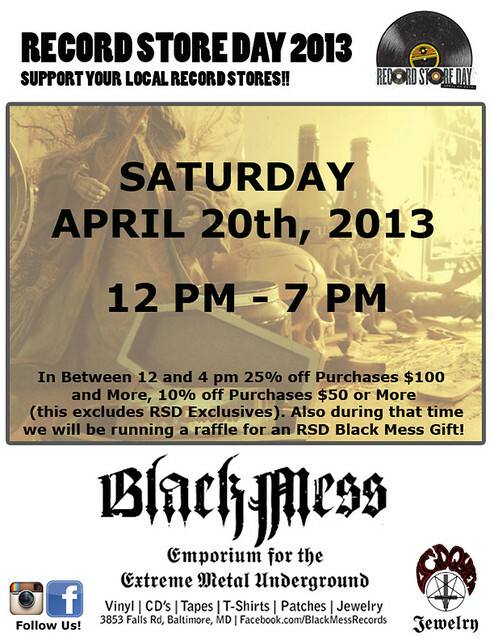 Black Mess specializes in extremely rare and underground metal and for Record Store Day they’ve really gone all out to bring their customers some rare and exclusive releases, some that no other store in the US will be selling for RSD. The store will be open from 12pm to 7pm Saturday, however from noon to 4pm all purchases over $100 will be 25% off and purchases of $50 or more will be 10% off. They’ll also be doing a raffle for a special exclusive gift. At about 8pm Black Mess will be vending their wares at the Sorcery show at Sergio’s Place in Silver Spring, Maryland. Details on that show are here. Black Mess has contacted many labels directly and managed to get some really amazing, limited edition test press releases. Many if not all of these items are not regularly available to the public and are limited to quantities of 10 to 20, of which Black Mess will probably only have 1 or 2 copies. These will not be available from Black Mess online, you have to buy them in person. The list of the rare and exclusive RSD merch at Black Mess follows below, I added links to the bands on the Metal Archives site so you can find more info on them if you’d like. 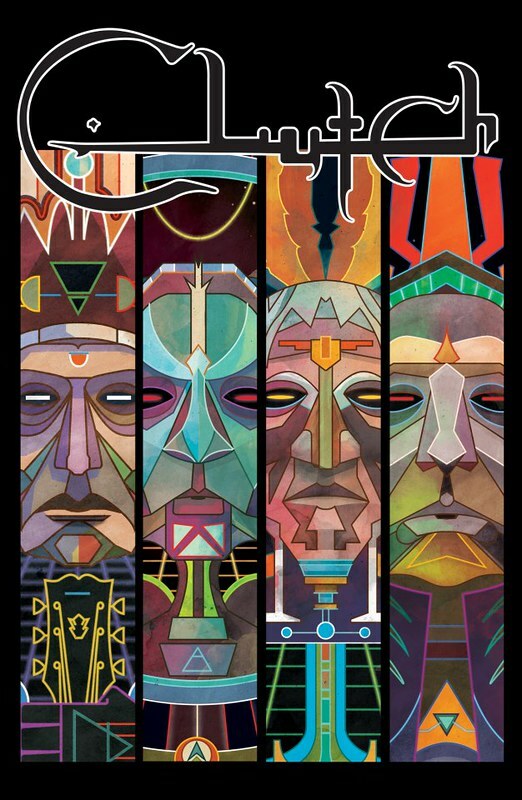 Mystifier – 7 LP Box Set includes 7 LP’s, a shirt, A2 poster, sticker, booklet and individual jackets for each LP, comes in a box. The Sound Garden doesn’t really specialize in heavy metal but they are one of Baltimore’s largest record stores. The reason I’m listing them here is because they’ll have Clutch in the store for Record Store Day. At 3pm Clutch will be performing 2 songs acoustically in the store and they’ll be hanging around until 5pm signing autographs. To my understanding you’re supposed to buy the new Clutch album Earth Rocker to be eligible for the autograph line, but they may let you buy other Clutch items as well instead. That killer Clutch image you see above will also be available at the store as a lithograph. Clutch’s show at Rams Head Live later that night is sold out, but you’ve still got a chance to catch them at the Sound Garden. I’ve heard that they often get long lines at the Sound Garden for RSD, sometimes taking over an hour to even get in, so I suggest showing up very early if you want to see the performance. On the Record Store Day website they have a section that has many dozens of quotes about record stores from musicians of every genre. As an added bonus I’ve scoured through them and reposted the quotes from people metal heads might find interesting below, however you can read the lengthy full list of quotes here. I hope you go visit one of our local record stores on Saturday and if I haven’t convinced you to then maybe these musicians will! “I still find it most rewarding to go to my local record shop where I can talk to people who know all about the music they’re representing, and where I can get answers to my questions without spending 45 minutes trying to find a link to customer service which would send me an auto-reply in three days. “It’s sad to see some of the developments in society, where everyday, more and more things conform toward a bland, non-diverse medium or “standard” if you will. The big, monetarily strong chain stores and companies are slowly burying the smaller, diverse (read: cool) indie ones!! No matter if it’s clothes, music or otherwise, this steady decline of uniqueness, diversity and “individual expression” is truly scary!! In the late 70s, it was always easy to find the latest releases from my favorite bands… Led Zeppelin, The Who, Kiss, Pink Floyd, Queen, etc., were all readily available at any record store. But in the early 80’s, as I discovered more “underground” metal bands like Iron Maiden, Judas Priest, Motorhead, Accept, Mercyful Fate, Loudness and Raven (from reading my imported copies of Kerrang), there was no place in small town Long Beach, Long Island to find the latest records from these bands I was reading about. Then I discovered Slipped Disc Records in Valley Stream, Long Island. They not only carried the albums from these bands, but also the 12″ singles with bonus tracks, the t-shirts, the imported live videos and anything else that existed! When the American thrash scene was beginning to erupt around 1983, I could always count on Slipped Disc to carry anything I was looking for from bands like Metallica, Anthrax, Slayer, Exodus, Testament, Flotsam & Jetsam, Death Angel and Nuclear Assault. Taking the train there every Saturday was the highlight of my week! And on the day I received my drivers license, the very first place I drove to was Slipped Disc to pick up Metallica’s Ride The Lightning album which was released that VERY day! (The imported version of course!) Now in 2008, the world is a very different place… the aforementioned chains and online stores have made it very difficult for the mom and pop stores to compete. In fact, my beloved Slipped Disc just announced it will be closing its doors for good. So let’s hear it for people like Mike from Slipped Disc and all of the independent store owners that have helped shape the metal scene for the past 25 years. Without them, a lot of us may not have existed… or at least have been as metal as we are! 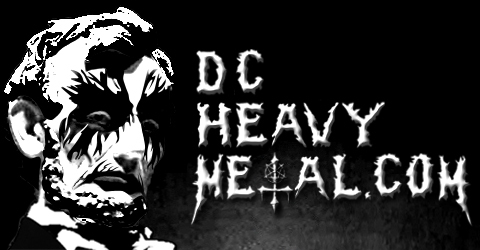 I’m new in town and I want to buy metal t-shirts,I live in SE Washington DC. I’ll be waiting for any responses.Thanks.